Maybe growing up means disappointing the people we love. Life is hard, honey. Everyone finds a way. In my head I know I've been in love before, but it doesn't feel like it. Being in love with you is better than the first time. It feels like the first time and the last time and the only time all at once. Oh my lord, this book! THIS FREAKING BOOK! Everything, Everything by Nicola Yoon is, to put simply, amazing. It's gorgeously written in a feather-light, delicate prose that is pretty simple in construction and straightforward, but ethereal and magical at the same time. Filled to the brim and overflowing with meaning, vividly painted emotions, memorable quotes and breathtakingly captured moments of sadness and joy, heartbreak and love, pain and glory; this is an absolute and indisputable must-read for fans of Jennifer Niven and John Green, or simply for anyone who enjoys a beautifully-written, meaningful and resonating contemporary fiction. I absolutely adored it. When Madeline was born, she was diagnosed with a rare immunological disease that prevents her from ever leaving the sterile safety of her home. She has various allergies and her body can't be exposed to germs or viruses from the outside world, because it's not equipped to fight them. Her home is her entire universe (well, aside from internet activities and online friends), and her mom and caretaker are the only two planets in her orbit. Until Olly arrives, and Madeline's universe explodes with the blinding power of supernova. 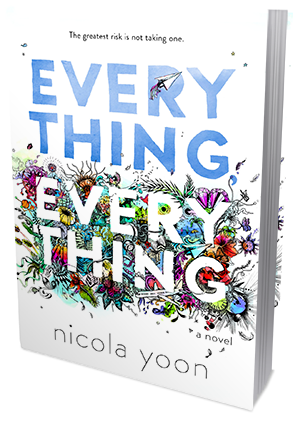 Everything, Everything is so achingly beautiful and gorgeously constructed, it is really hard for me to comprehend that this is Nicola Yoon's debut novel. Effortlessly narrated, filled with perfectly crafted scenes and moments accompanied by little visuals (like diary notes, emails, drawings, etc), it is quite a powerful reading experience. The book is completely unputdownable. You'll be glued to its pages just like I was, craving more with every small sip you take, needing to know everything, to race ahead and find out what happens next, but not wanting to miss a single word, a single breath, a single little Madeline and Olly moment. I really tried to pace myself while reading this book, because I really wanted to savour each and every page, but it wasn't easy. I just wanted to inhale it all and fill my soul with it, and just keep it there, in my heart, forever. 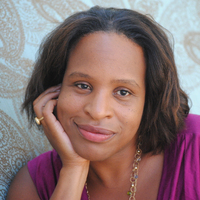 Nicola Yoon is one incredibly talented writer, and I am so glad to have discovered her. I already know I will read every single book she'll ever write, she goes straight onto my automatic to-read list. The way she developed her characters and gave them so much depth and complexity, really took my breath away. Her prose is nothing short of perfect, her dialogues are spot-on and full of amazing chemistry, her every sentence carries meaning and stays with you. I loved how she described all the relationships in this book - and not just the one between Olly and Madeline, but also between Madeline and her mom, Madeline and her nurse, Olly and his parents and sister... they were all so authentic and convincing, they pulled on my heartstrings and made me feel things. I particularly loved how mature Madeline acted, despite her truly horrible situation. I loved that the relationship with her mom was so drama-free; based on mutual trust, understanding and affection. And boy, watching this girl fall in love with Olly and seeing them together, it just melted me. It was phenomenal. I don't think I can praise this book enough, but ultimately you need to experience this awesomeness for yourself. I promise you, you won't regret.